In many cases, a divorce can end with you receiving a judgment against your ex-spouse for spousal maintenance (alimony). However, your judgment has an expiration date. County court judgments expire and are unenforceable six years from the date of the judgment, while district court judgments expire and are unenforceable 20 years from the date of the judgment. Sometimes, after you’ve attempted the various collection processes, you still have money owed to you with the expiration date approaching. If you revive your judgment, your deadline to collect the judgment starts all over again, and you can continue your collection process. Make sure you start this process early. The court must rule on the revival at least one day prior to the expiration date, so you need to file and serve all documents well in advance of that deadline. This initiates the process of reviving your judgment through the court. You must complete all sections and include your original case number, the date and amount of the original judgment, the amount of the judgment that is still unsatisfied, the name of your ex-spouse (or whoever owes you the money), and the expiration date of the original judgment. You also will need to list out all the efforts you’ve made to collect the judgment. You’ll need to file this blank notice with the court when you file your motion. Once you file the Motion for Revival, the court will send this notice to your ex-spouse and wait 14 days from the date of service. If your ex-spouse does not respond in writing with why the unsatisfied judgment amount should not be revived, the court will then review and rule on your motion. You’ll also need to file this blank order (or a proposed order) with the court when you file your motion. If your ex-spouse hasn’t responded in time, and if the court believes your judgment should be revived, they will issue this order granting your motion. You will need to serve the motion, notice, and proposed order to your ex-spouse. Generally, this is done through personal service via the sheriff’s department or a private process server. You can serve via mail or publication but only if it’s approved by the court. Once you have served your ex-spouse, you must provide an Affidavit of Service (JDF 98) to the clerk. It is possible that your ex-spouse could file an answer to your Motion for Revival within the allowed 14-day period. If this happens, the court will set a hearing on the issues and you both will be allowed to present your side of things. Based on that hearing, the court will decide whether or not to grant your motion. 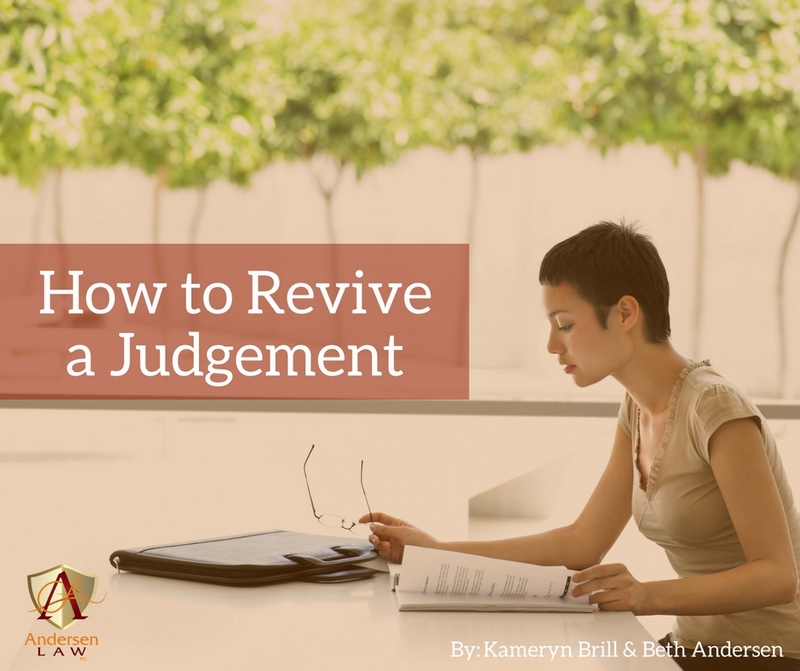 If your judgment is revived, the six-year or 20-year period starts over again, and the process to revive a revived judgment is the same as above. If you are running out of time to enforce a judgment and you need help or have questions about the process, please contact Andersen Law PC at 720-922-3880 or email beth@andersenlawpc.com. Kameryn Brill contributed to this post. Previous Previous post: Will You Please Help Me Support Business Owners in Need?